Claudette “Claudia” Antuña, Psy.D., MHSA, LICSW, submitted a symposium titled “Understanding assessments for Immigration Court and how to use the interpreter in determining trauma” that was accepted for presentation at the APA Convention in Denver 2016. This will be presented along with Leonara Cabrera, MA, a doctoral student at Fielding University). Dr. Antuña received the Washington State’s Psychological Association Social Issues Award, which was awarded on December 12, 2015 for her work in providing forensic evaluations to the Immigration Court and the Department of Homeland Security on behalf of immigrants seeking legal relief. Starting January 12, 2016, Dr. Antuña was recently appointed Chair of the Immigration Committee for Division 52 (International Psychology). 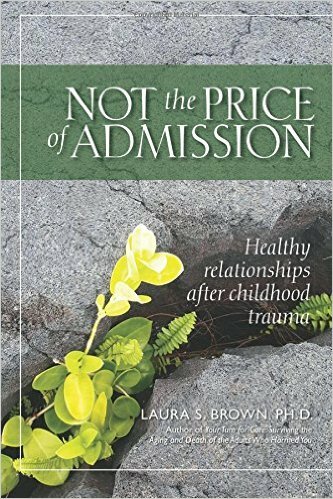 Laura S. Brown, PhD, ABPP, the 2010 president of Division 56, is announcing the release of her latest book, Not the price of admission: Healthy relationships after childhood trauma. The book, which synthesizes and integrates the wisdom of the field of trauma studies with Dr. Brown’s nearly 40 years of work with survivors of complex trauma, discusses pathways towards healthy relationships in which a survivor stops “paying the price of admission” for relationships through tolerance of abuse, neglect, exploitation, or devaluation. It reviews and synthesizes the trauma and attachment literatures, providing survivors with information about attachment, dissociation, trauma reenactments, and other relational dynamics that are affected by childhood attachment wounds. A free downloadable copy of the first chapter, as well as purchase options, can be found at www.drlaurabrown.com/written/not-the-price-of-admission-healthy-relationships-after-childhood-trauma. This is Dr. Brown’s second book for trauma survivors, and is an outgrowth of that first volume, Your turn for care: Surviving the aging and death of the adults who harmed you. Katy Dondanville, PsyD, ABBP, Brooke Fina, LCSW, Alan Peterson, PhD, ABPP and Joshua Friedlander, PsyD, were accepted to present a Full-Day Continuing Education Workshop at the Annual Convention on Implementing and Adapting Treatment Protocols for PTSD with Active Duty Military Service Members. This workshop will describe treatment considerations and hands-on techniques for clinicians utilizing Prolonged Exposure and Cognitive Processing Therapy pertinent to treating military personnel with PTSD. Elaine Ducharme Ph.D, ABPP, recently published a new book, Assessment and Treatment of Dissociative Identity Disorder, through TPI Press. This book gives readers a basic understanding of the theory and research supporting the diagnosis of complex trauma and dissociative disorders and provides practical clinical recommendations for diagnosis and treatment, including options for integration. She presented an all day workshop on this topic at the Division 42 Fast Forward Conference in October of 2015. Charles Figley, PhD, has an article currently in press titled “Risk and protective factors related to the wellness of American Indian and Alaska Native youth: A systematic review” to be published in International Public Health Journal. This article is one among a series of reports focusing on American Native Americans and their families in this region. There will be at least four more papers in the coming year or 15 months. Dr. Figley has also published a series of papers from an exhaustive analysis of hundreds of documents relevant to understanding why the US experiences these periodic crises of health care for war fighters and their families, led by trauma psychologist, Mark Russell, a fellow professor and colleagues at Antioch College in Seattle where he leads an institute focusing on combat stress injuries research and policy. Since 2013, Dr. Figley has been working with a team to transform his 2012 Encyclopedia of Trauma: An interdisciplinary Guide, into a series of courses. Trauma! is an undergraduate survey course that uses knowledge blocks (learning modules) developed by several dozen colleagues throughout the world who are experts in their area and in the Encyclopedia. This paper explains how the course emerged and similar game-based learning efforts such as Boston College: Moylan, G., Burgess, A. W., Figley, C. R., Bernstein, M. (2015).Motivating Game-Based Learning Efforts. Higher Education Journal of Distance Education Technologies, 13(2), 55-73, April-June. Dr. Figley has also published over 15 non-refereed publications over the past year. Ilene Serlin, PhD, recently trained at the University of Hong Kong on 9/15/15, provided a training workshop for psychology interns at the Community Institute for Psychotherapy on “Embodiment and its application to work with trauma” on 12/11/15 and 12/17/15, and provided a training workshop at the American Dance Therapy Association on “Integrating the arts in building resiliency in regional contexts” on 10/24/15 in San Diego, CA. The latter workshop has recently been submitted as an article to the American Dance Therapy Journal and is in press.